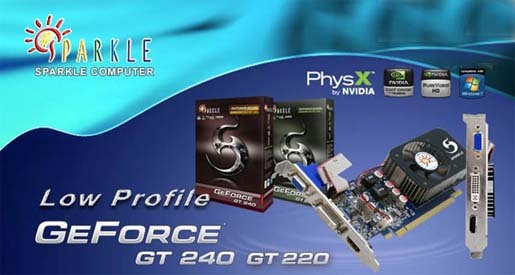 SPARKLE Computer Introduces GeForce GT240 And GT220 Graphics Cards! 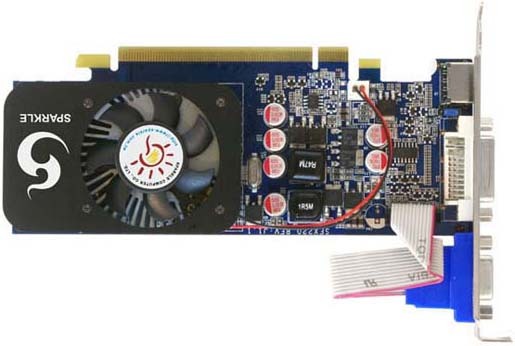 One of the biggest professional VGA card manufacturers and suppliers SPARKLE Computer has launched its latest SPARKLE GeForce GT240/GT220 low profile graphics cards. They are the world first and lowest profile graphic cards based on GeForce graphical chips. They are GT240 and GT220. The both of the SPARKLE GeForce GT240/GT220 low profile cards provide a full range of 3D performance and amazing high-definition home theater video experience to the mainstream. The first version GT240 lets you turn your photos and home videos into masterpieces from a single click on a button, view a flawless Adobe Flash 10.1 video in full screen HD, and play the latest and favorite games with fast frame rates and NVIDIA® PhysX® effects. The second version GT220 is an essential component to the modem PC in order to deliver gorgeous graphics, fantastic video and crisp responsive photo editing.